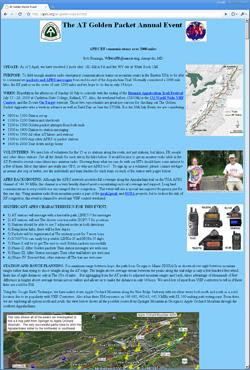 This week's Surfin' visits Web sites related to operating with low power on the Appalachian Trail. Also, Surfin' explains that Googling and blogging are not rocket science! Depending on the weather, I usually plant my vegetables during the week after the Dayton Hamvention. Well, the weather has been lousy around here: we have had a very cold and wet spring. It has been so cold that I actually have turned the furnace on a few times since returning from Dayton. Weather be damned, June was only days away and I had to get the vegetables in the ground. So, Tuesday evening I prepared my five Earthboxes: I loosened up the soil with a gardening fork, removed any roots and stalks leftover from last season, put in two cups of fertilizer in each box, installed new blag plastic covers (I used black plastic garbage bags cut to size), then filled the reservoirs with water. Wednesday evening, I planted six Big Boy tomato plants, six red pepper plants, and three basil plants. Then, I ringed each plant with slices of Styrofoam coffee cups to keep out the snails. And I was done. I checked the plants this morning and they survived the night. 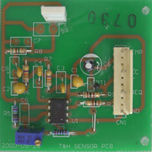 Yesterday, I started backfilling the blog with posts from my old blog. Not sure how far back I will fill: maybe back to the beginning of the year and then pick and choose earlier posts. I also tweaked the layout of the blog yesterday and I will continue tweaking it until I am satisfied with the way it looks. This weekend, I worked on this new blog and it is starting to get into the shape I want it to be. I am fed up with WordPress as my blogging platform and am switching to Blogger. This week, Surfin' revisits the Dayton Hamvention and attempts to demystify Google. Figure 1. 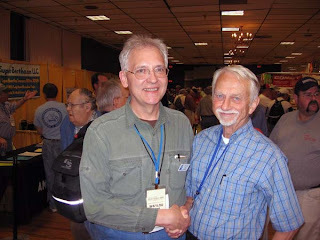 Your author meets Astronaut Owen Garriott, W5LFL, the first ham radio operator in space at the Dayton Hamvention on Saturday, May 16, 2009. I was up at 6 AM and on the road at 7 AM, which is about 2 hours later than my normal Dayton departure. As I approached Columbus, I decided to take the southern route through Pennsylvania and avoid the construction delays I ran into on I-80 in Western Pennsylvania on Wednesday. In addition, it would be nice to see some new scenery for a change; not exactly new, I’ve been this way before, but it has probably been about 15 years since I did the southern route, so I was up for it. I was a little surprised by the amount of the toll on the Pennsylvania Turnpike ($10.95 to get from the Pittsburgh suburbs to the I-81 exit near Harrisburg), but it was worth it because there were no construction delays. 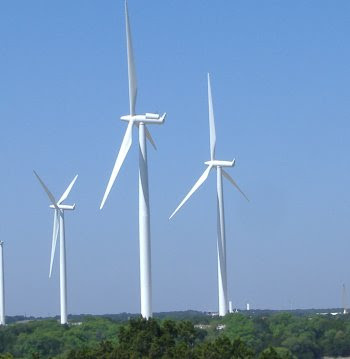 On I-81 between Harrisburg and Hazleton, the interstate passes up close to a wind power “farm” and I was very impressed with the size of the windmills; they are huge! The scene of a dozen of these huge spinning beasts in the middle of a Pennsylvania forest reminded me of those Martian tripods lumbering through the Hudson Valley in the 2005 remake of War of the Worlds. I arrived home 12 hours and 20 minutes after leaving the Dayton Airport Hotel. APRS coverage was good, but seemed spottier on the Pennsylvania Turnpike vs. I-80. Traffic was heavy in some spots and almost non-existent in other spots. My gas mileage for the 1600-mile roadtrip averaged 32 mile per gallon; not bad for an all-wheel-drive vehicle with 35,000 miles under its belt. Every year, after I return home exhausted from the Hamvention roadtrip, I swear that I will never do it again, but time will tell. The weather on Saturday at the Dayton Hamvention was not pleasant, but I did visit the flea market during breaks in the deluge. A sign of the times, approximately one-third of the flea market spots were empty and attendance overall seemed down. On the air, I heard someone mention that approximately 14,000 admittance tickets were sold, which is down substantially from the 30,000-plus attendees of past years. “Not much new and exciting” was the word on the street and I have to agree. I grabbed a bunch of product data sheets to look over later, but most of the sheets I grabbed were for items that were already out there for sale and not much new. While roaming the convention floor, I saw a familiar face, so I stopped him and asked for a photo. Owen Garriott, W5LFL, the first ham radio astronaut gladly complied and the result is above. By mid-afternoon, I was very tired and was not looking forward to a 12-hour roadtrip on Sunday! 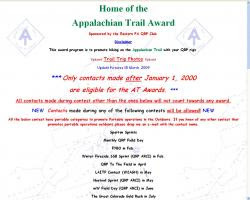 This week’s Surfin’ visits a Web site detailing the effort to traverse the Appalachian Trail by Amateur Radio. When I returned to my room last night, I discovered that the hotel’s Internet access was down and was still down when I awoke this morning, so I was not able to write a new blog entry. So I dragged my Mac to the Hamvention and am using a variety of free Internet access points available in the Hara Arena. Friday was eventful and the weather was excellent. The forum I moderated (the APRS Forum) had standing room only. There were 15 rows of seats with 20 seats in each row and they were just about full, plus there were probably 50 to 100 people standing, so I estimate 350 to 400 in attendance and very few left during the hour plus of presentations. The only problem was that we ran out of time and had to abandon the question and answer portion of the program. I spent the rest of the day working the TAPR booth or walking around the convention floor viewing the various exhibit booths. I ran into a lot of old friends and I met some folks in person, who I had only met over the air or over the Internet. 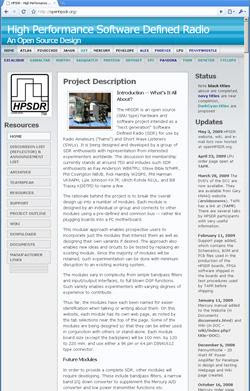 There was a lot of interest in the HPSDR project that TAPR is supporting. The booth had two HPSDR transceivers set up at each end of our five-booth spread communicating with each other on 52 MHz and this set up was a big attraction. 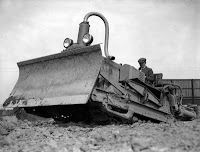 People could see the “project” in operation. 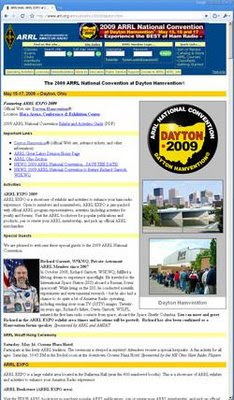 After our day at the convention, we attended the TAPR-AMSAT annual Dayton banquet. Despite having to drive halfway to tarnation to the site of the dinner, I had an enjoyable time. Dinner was good and I encountered more old friends and acquaintances (some from the packet radio era) and enjoyed the after dinner speaker, Richard Garriott, W5KWQ, a recent tourist astronatut, and son of Owen Garriot, W5LFL, the first astronaut ham. Both father and so were present at the dinner. I returned from tarnation and found no Internet access at my hotel, so I went to bed about 11:15 PM and fell asleep instantly. Arrived in Dayton, safe and sound. Met my neighbor from Super 8 at breakfast: Earl, KC8TC, from Michigan. 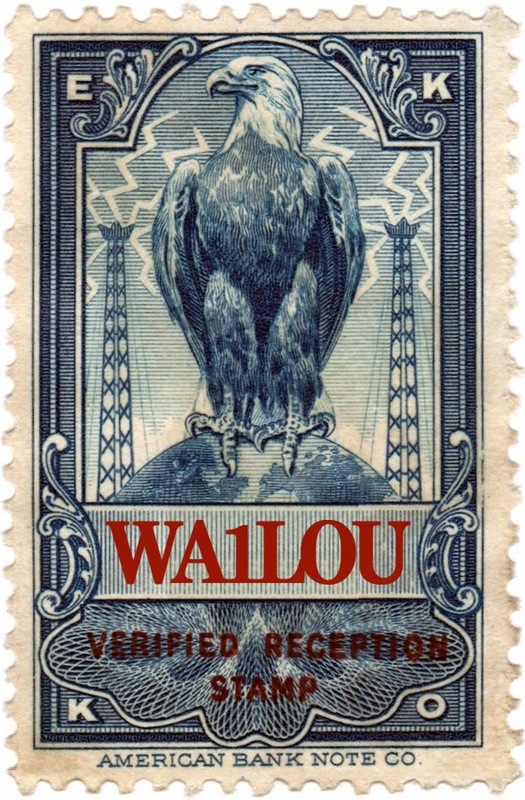 He was not going to the Hamvention, but to the Garden State. I successfully got through Akron without missing an exit, although the last exit was a close call. Rained lightly off and on until Akron. Between Akron and Lodi, it rained heavily. Then the rain tapered off and as I approached Dayton, the sun began poking through. Drove just under five hours today from Clarion, PA, to Dayton with one pit stop on the way to buy a refreshment. Total driving time from home (725 miles) was about 12 hours. Like I wrote earlier, I lost about an hour due to the road lane closures due to construction. I am tired and I am going to rest until the TAPR board meeting at 5 PM. 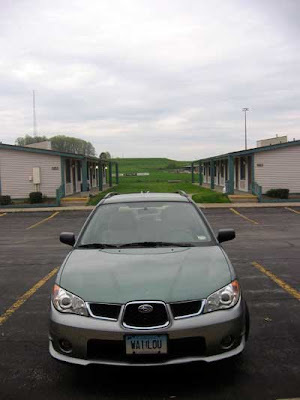 Left home at high noon yesterday and arrived at the Super 8 in Clarion, PA, at 7 PM. You can see my APRS track here. Traffic was light most of the way and I made good time until the last 75 miles of the trip. 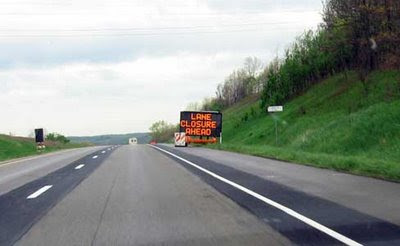 Construction on I-80 turned the four-lane highway into a two-lane highway and during the last 5-mile segment of construction, traffic moved at a 5 MPH clip! I probably lost close to an hour due to the construction. Not much activity on 146.52 MHz, but I expect that will pick up today as I approach Hamvention. A retired couple in the next room have a ham in the family. Their Cadillac SUV does not have ham license plates, but I noticed a call sign made up of self-adhesive letters (the kind you use to identify rural mailboxes) on the back of the SUV; I did not recognize the call and forgot it! Weather was good driving out, but as I got farther west, it began to cloud up and the temperature dropped. Looking out this morning, the ground looks wet and the clouds are ominous (as you may be able to see in the photo). Next stop, the Dayton Airport Hotel in beautiful downtown Vandalia, Ohio! 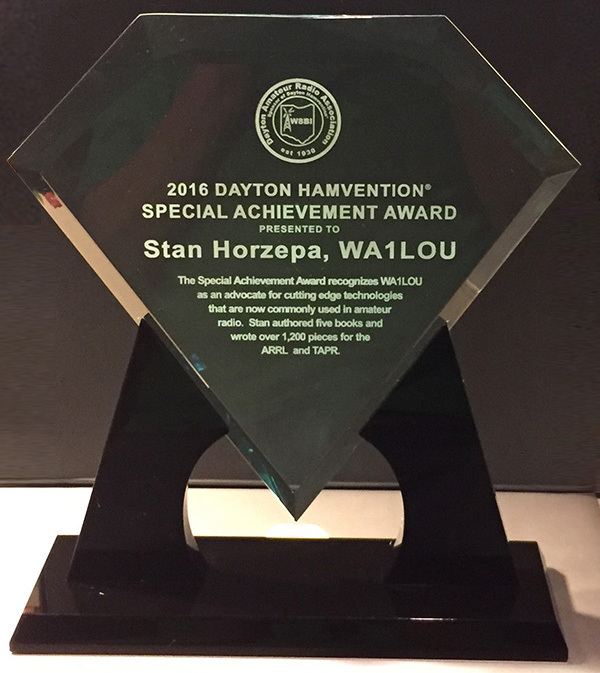 This week’s Surfin’ anticipates hunting for SDR at the Dayton Hamvention.